For my 31st birthday I wanted to go some place really special. I chose Crayola Experience over New York City. To be fair I chose New York City for my 30th birthday. The Crayola Experience had just barely opened. 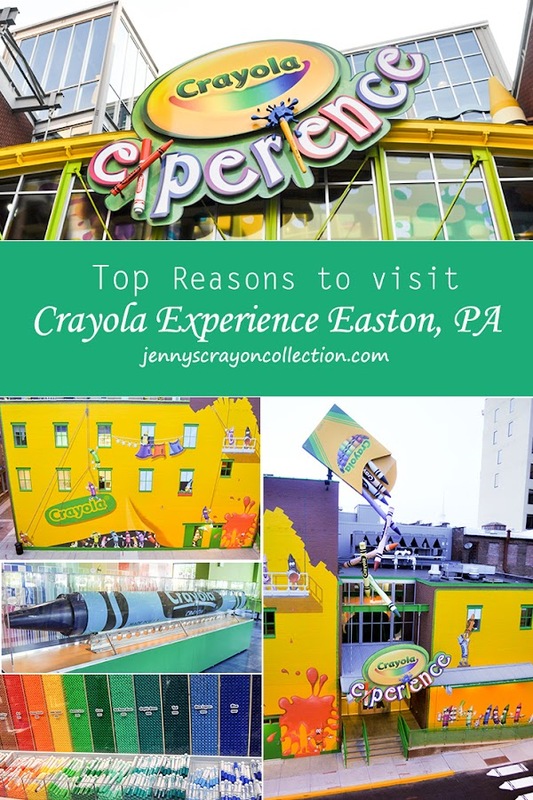 At that time I had a 3 month old baby and we got to Easton a little late, but we were still able to enjoy our time at the Crayola Experience in Easton, Pennsylvania and have a lot of fun. The hours are generally 9:30 or 10:00 to 4:00 or 6:00. Check before you go. The tickets are 19.99. I have a special discount for my readers, if you use this link you can save 3 dollars and get tickets for 16.99! 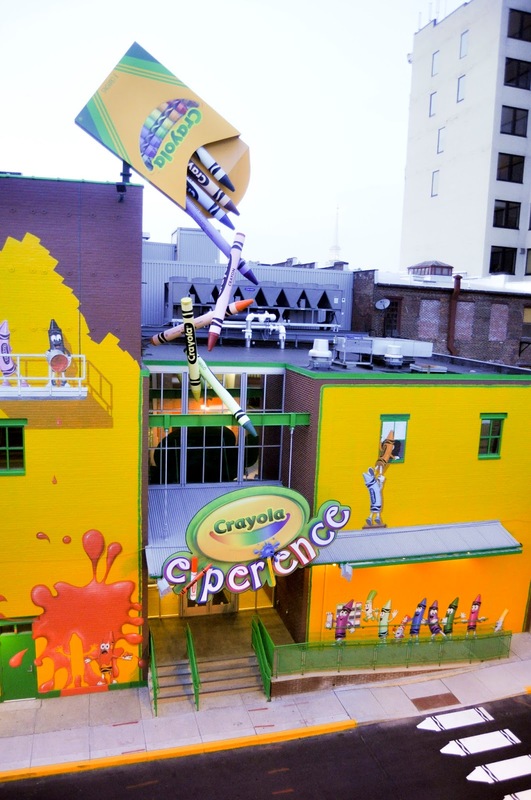 The Crayola Experience was first opened in spring 2013. Before that it was called the Crayola Factory. The Crayola Factory was originally opened in 1996. The Factory was originally opened at the urge of city leaders to help revitalize downtown Easton. It has since expanded and the area now boasts a large number of businesses. 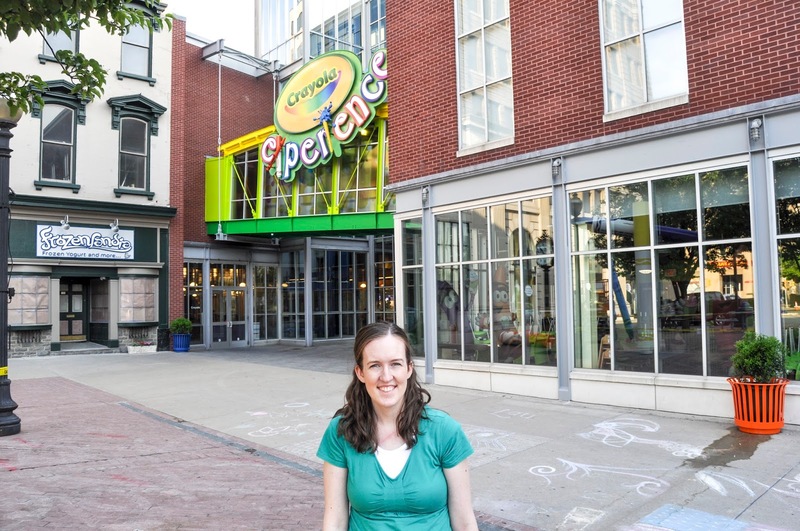 It was rebranded and renamed Crayola Experience in 2013. Many attractions were added that focused on kids and color. Since then Crayola Experience has really expanded. 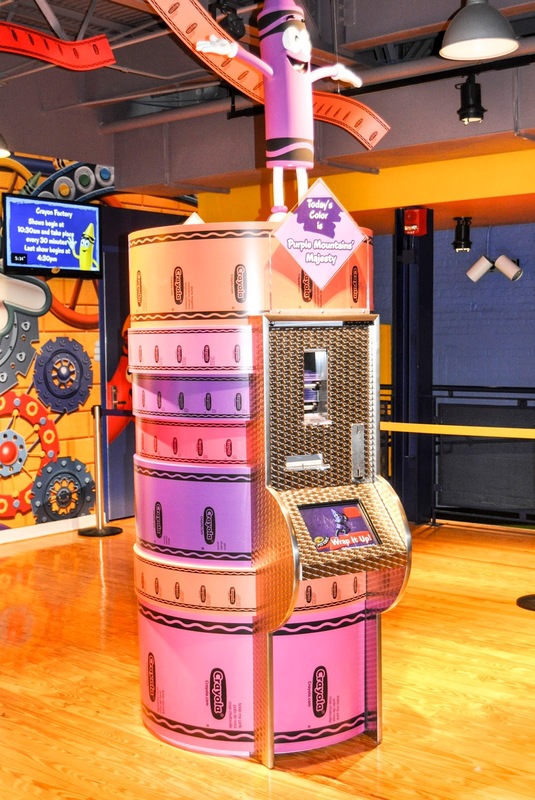 In July 2015 Crayola opened a Crayola Experience in Orlando, Florida. 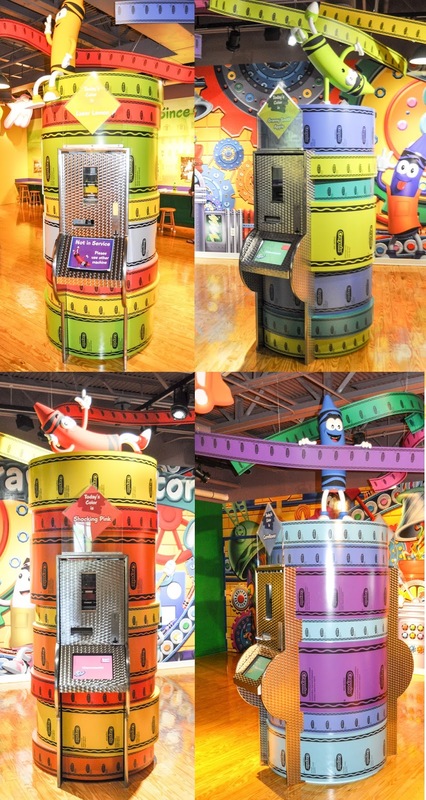 In May 2016 Crayola opened a Crayola Experience in Minneapolis, Minnesota at the Mall of America. In spring 2018 Crayola will open another Crayola Experience in Plano, Texas at the Shops at Willow Bend. My dream would be to visit all these places. This is not the first attempt to open a color themed park. 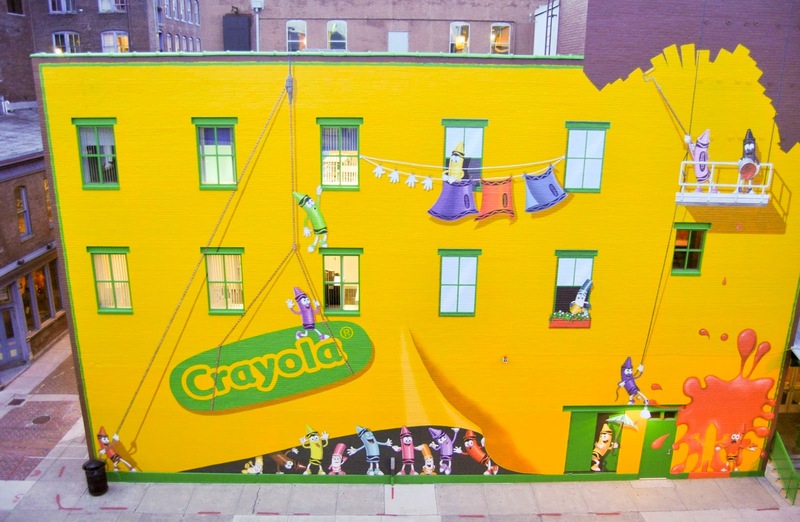 Crayola Works was opened on June 21, 2002 outside of Baltimore, MD. It closed in 2004. I do not know why it closed, but I think Crayola definitely learned from those experiences because the other locations have been doing so well. Well enough Crayola Experience is expanding all over the country. I would love to live close enough to one to go often. 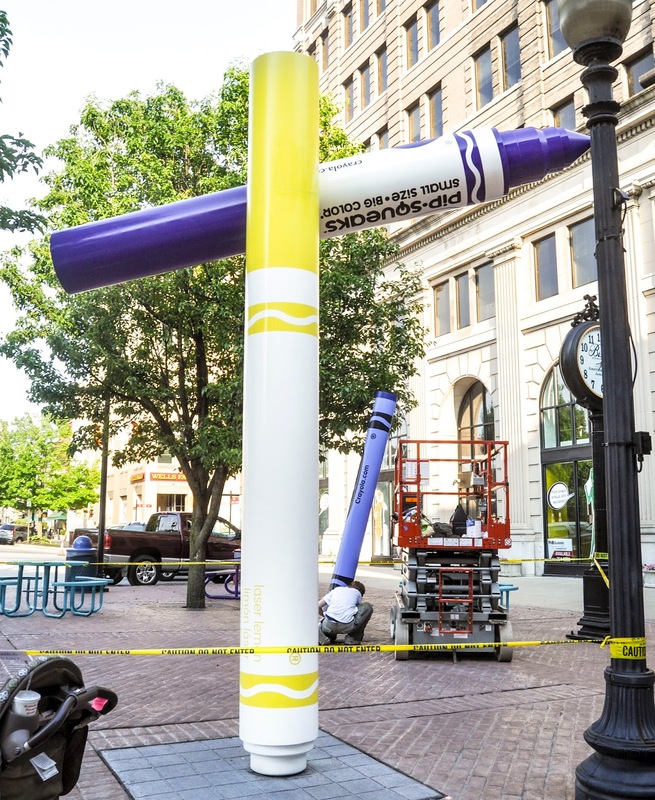 I really think they should a Crayola Experience in downtown Kansas City at the Crown Center. The Crown Center is a mall owned by Hallmark, the parent company of Crayola. 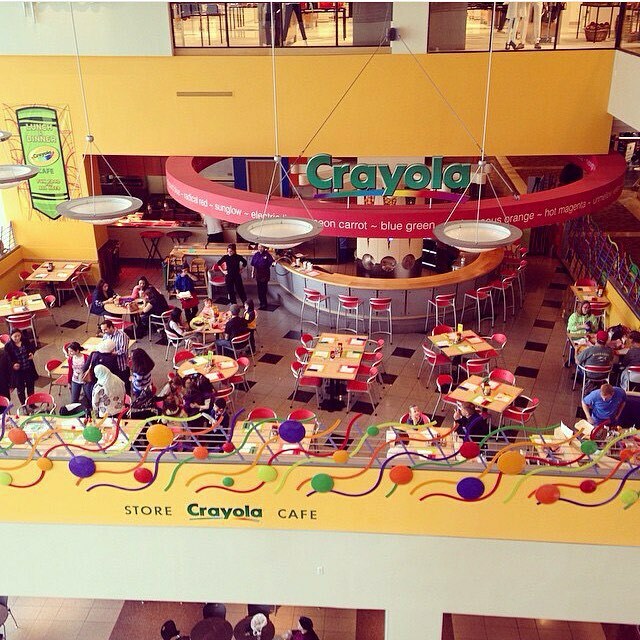 They already have a Crayola Store in the Crown Center and Kaleidoscope activity center. Kaleidoscope is a free attraction that is smaller than the Crayola experiences, but has a few of the same activities, puzzles, glow in the dark coloring, a drying oven, and a painting station. I think it would really add to the area. Activity Studio: Cut, color and paste crafts. Art Alive! : Create digital works of art, they are then displayed on a giant wall. Be A Star: Create your own coloring page. 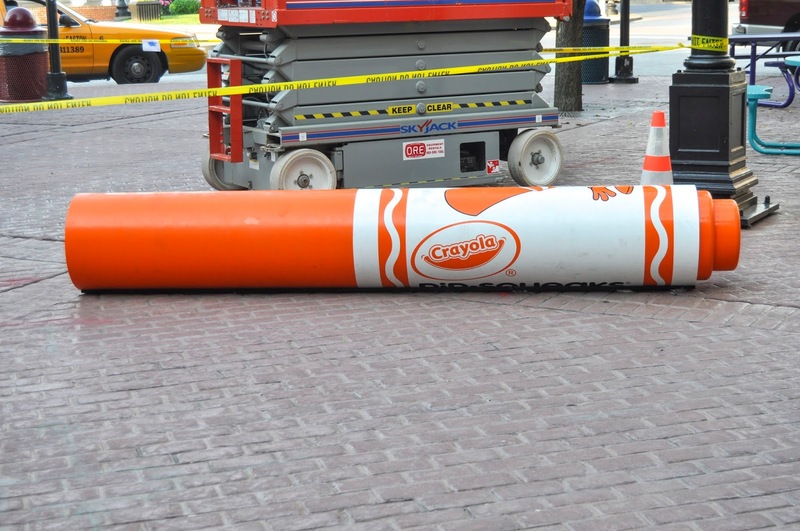 The worlds biggest crayon is on display by the Crayola Cafe. It was made October 11, 2003. It weights 1500 pounds, is 15 feet long and 16 inches in diameter. 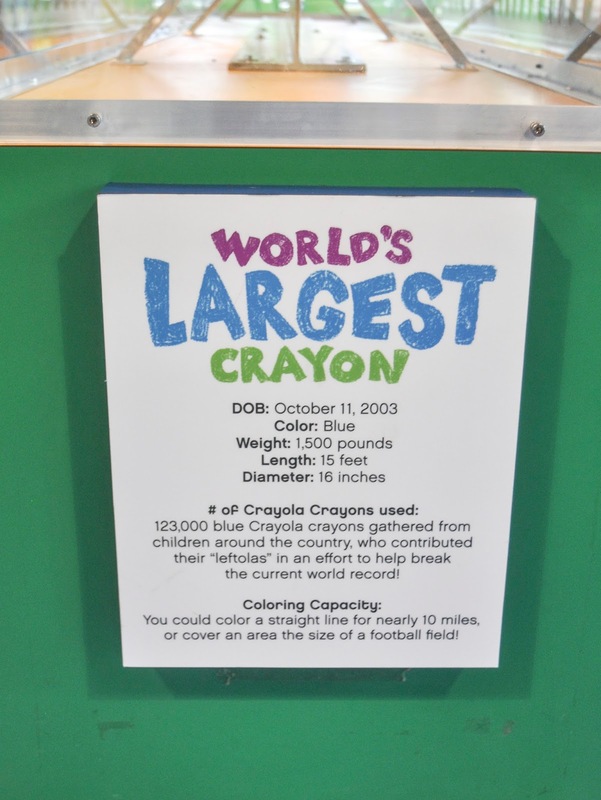 It was made by "123,000 blue Crayola crayons gathered from children around the country, who contributed their 'leftolas' in an effort to help break the current world record!" Cafe Stage: Learn about the history and science behind crayons. I do not think this was here when I went, I would have LOVED it. Color Magic: Bring coloring book pages to life in a 4-D experience. Cool Moves: Dance with your favorite crayons. This was my daughters favorite part. Crayon Factory: Watch a demonstration of crayon making. I wish they still offered tours however. This was neat, but I wanted to be able to see the real factory. Drip Art: Make a drip art from melted crayon. Here is my daughter's creation. Stomp and Play: Play games on an interactive floor. My daughter loved this area. I only do not have a picture of her there because I do not show put pictures of my own kids on my blog. 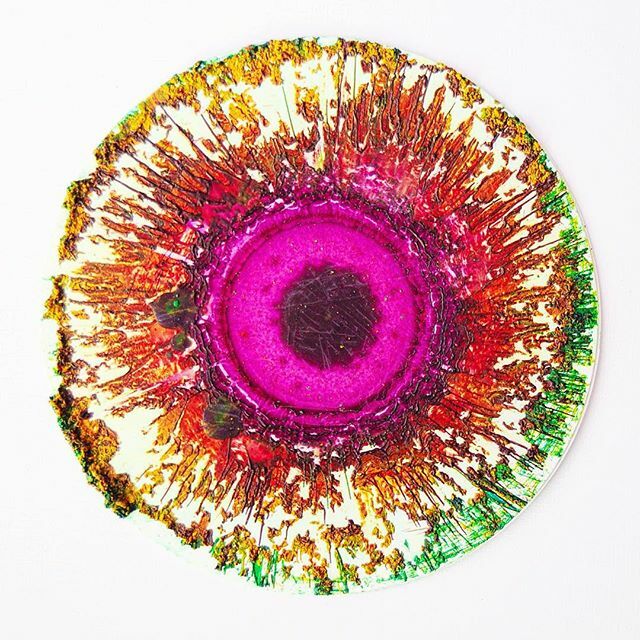 Meltdown: Create artwork from melted crayons. Modeling Madness: Use model magic to make creations. Paint Palette: Paint with water colors and puffy paint and then dry in the oven. Puzzle It! 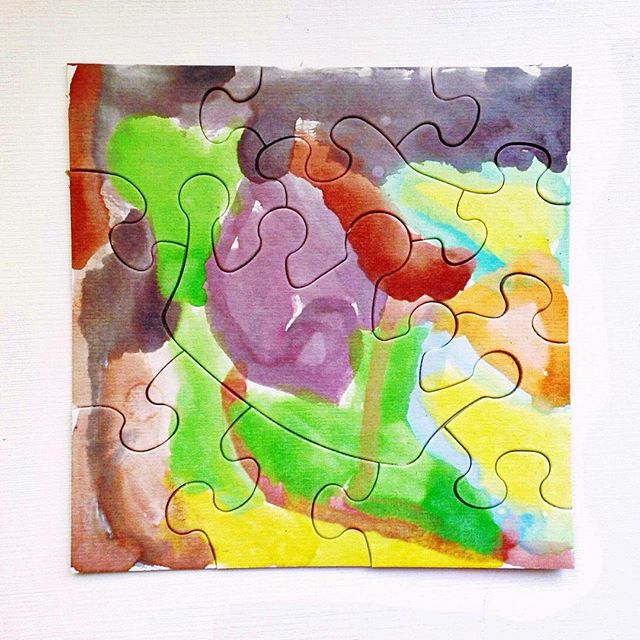 : Create a personalized puzzle. Here is a puzzle we created at Kaleidoscope activity center. We painted it, dried it in the even then made it into a puzzle. Rockin' Paper: Watch your coloring creations dance. Toddler Town: Toddlers can play with multi-colored pegboard and play in a giant ball maze. Wrap it up! : Make custom Crayons. The crayons available are: Laser Lemon, Shocking Pink, Granny Smith Apple, Purple Mountain's Majesty, and Cerulean. Here are our custom crayons, the cerulean machine was not working. I loved the history that was lining the walls of the Crayola Experience. I really wish there was a separate museum for Crayons. That is my dream. I would love to see one or be part of one some day. I am so glad they have this. 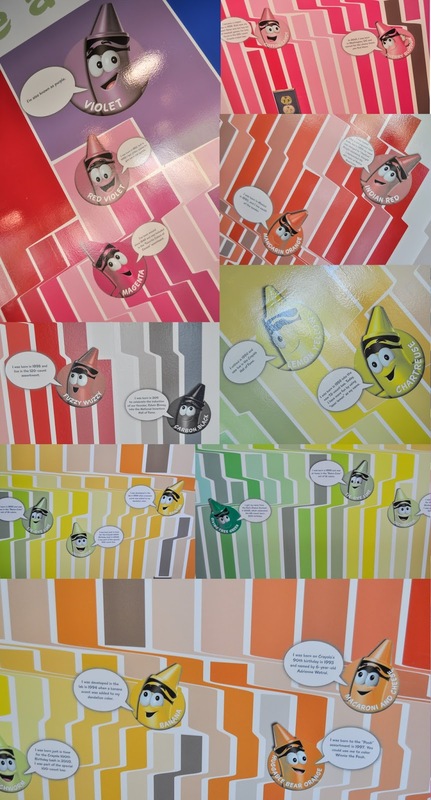 It is a wall talking about the history of Crayola. 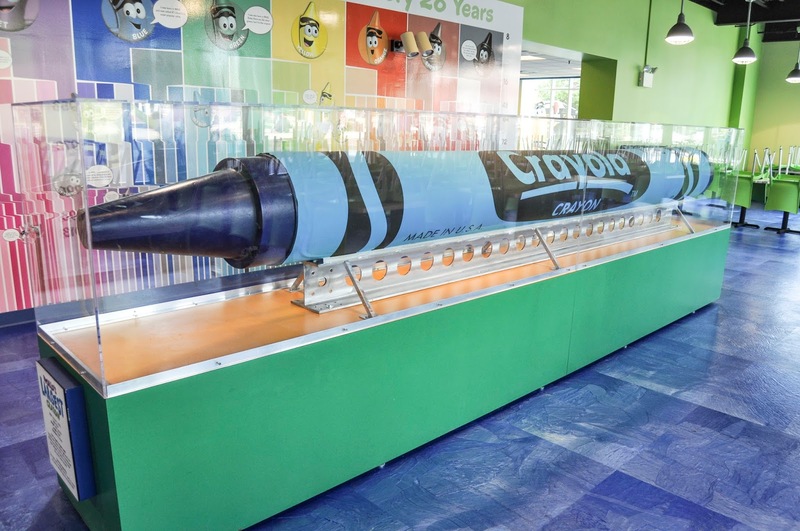 Behind the worlds largest crayon was a wall celebrating Crayola's history with history of some of the specific colors. There was also a Cafe Crayola. 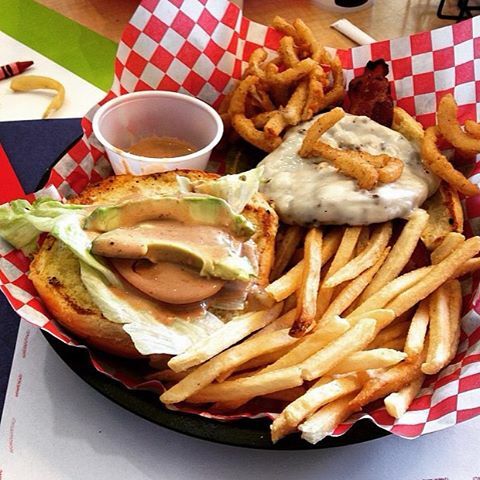 I have not eaten at this location, but I ate at the one in Kansas City and it was delicious! 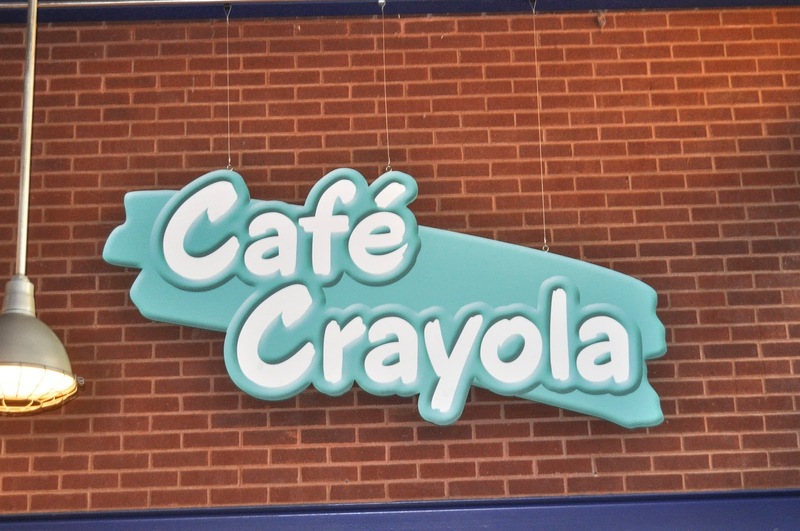 Food and Cafe is the Crayola Cafe in Kansas City, Missouri. 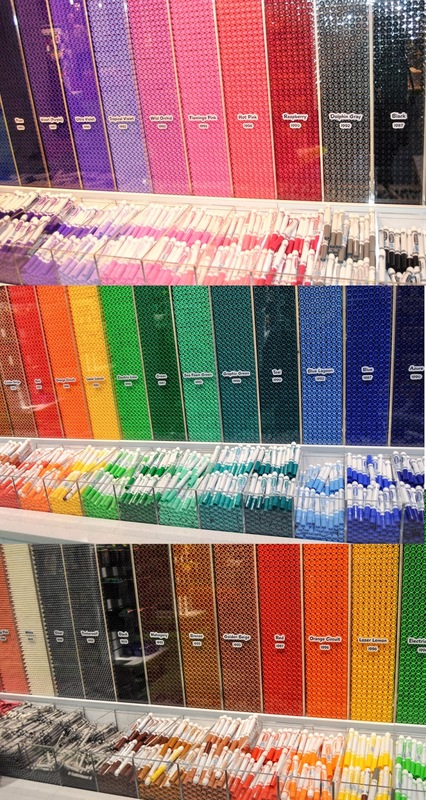 The Crayola Store was my favorite area. I have never seen SO MANY Crayola items all in one place. I definitely stocked up. I started completing my collection of Crayola plastic dishware at this location. The dishware collection features cups, plates and bowls that are BPA free, dishwasher and microwave safe. My sister bought the cups for me earlier and I had no idea how many other colors or items were in the collection. They did not have the whole set. I finished the collection at the Crayola Store in Kansas City. We also picked out a container of crayons from the Pick Your Pack wall. We fit about 140 crayons in this tin. 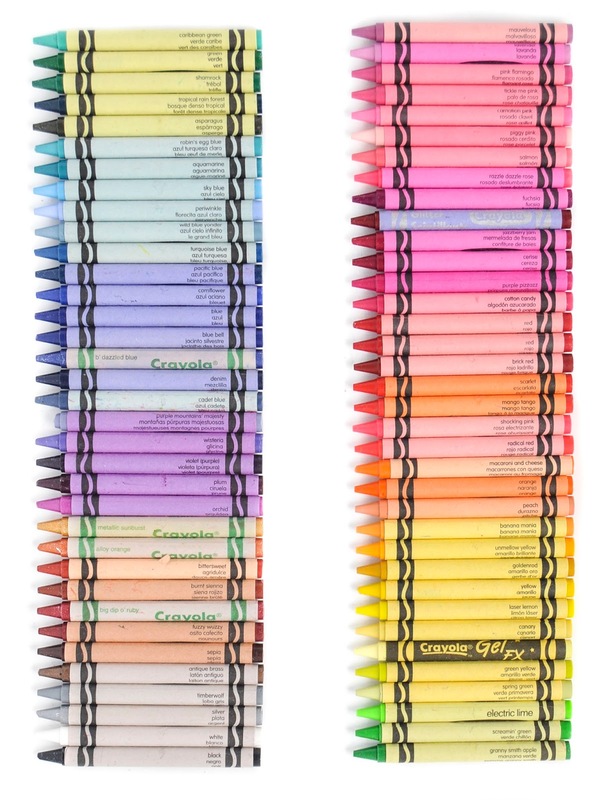 These are all the crayon colors that were available at the time. The wall had all the marker names and when the name was first created. It also did this for the crayons, but I did not take pictures. The back of the building one of my favorite parts of the building. It features a big box of crayons being dumped and then mural of crayons doing various on the back of a yellow building with artificial windows. The crayons are painting it, raising a sign, putting out Crayola towels on a laundry line, sneaking around the building, climbing in windows, and peaking out from the painting. It is super cute. One of my favorite parts is the crosswalk they painted. Instead of regular lines, it is crayons. If you are a parent of children this experience will not disappoint. It was super fun and engaging. Your kids will be entertained for hours. My child was very entertained and loved all the activities and bright colors inside. As a nursing mom who had to nurse I as super impressed with their nursing room. It was the best nursing lounge I have ever seen! As a collector you will love the history on the walls, the large crayon, customizing your crayons, the Crayola store where you can buy things you can not find anywhere else. You may be disappointed however by how much history is missing and the fact you can not go on a tour. I really wish they would open a museum close by for the adults. I think the kids would love it too. Hallmark has a museum in downtown Kansas City by the Kaleidoscope activity center. 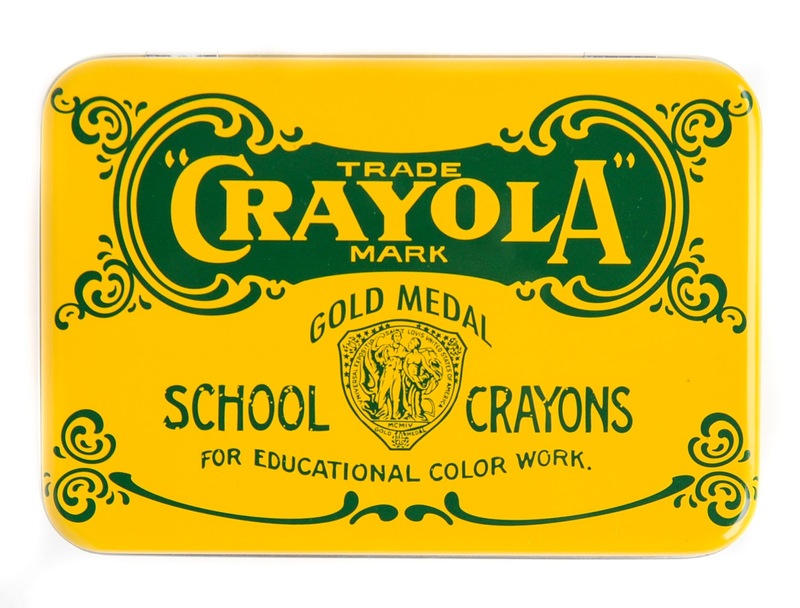 It is chocked full of history and some of Crayola's history. I may post about it one day. I would love for there to be something like this here. 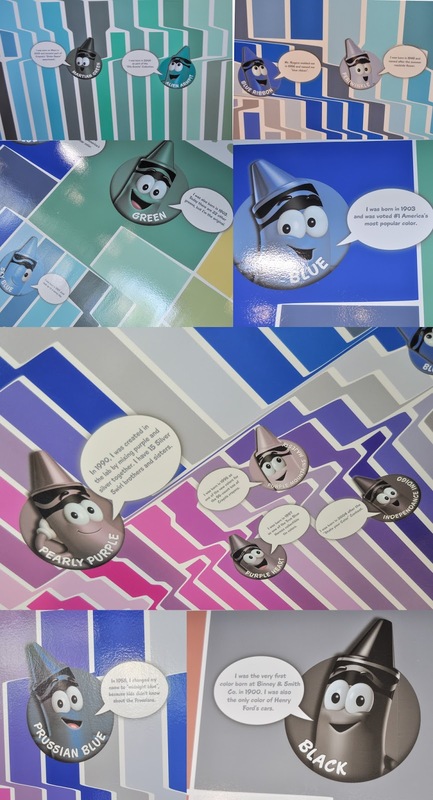 I think it would really draw in lots of visitors to city ones that may not necessarily be interested in the kids activities in the Crayola Experience. They could also charge extra to go on a behind the scenes tour at Crayola. I worked Boeing and they do this at their Everett manufacturing center. The tour costs extra but is totally worth it. Many companies also offer the option of watching workers through a window, though I would love a tour more than this option. But all the drawbacks of history and no tour definitely do not diminish from making this A MUST for every Crayola collector out there. Check out my fellow collectors visit. 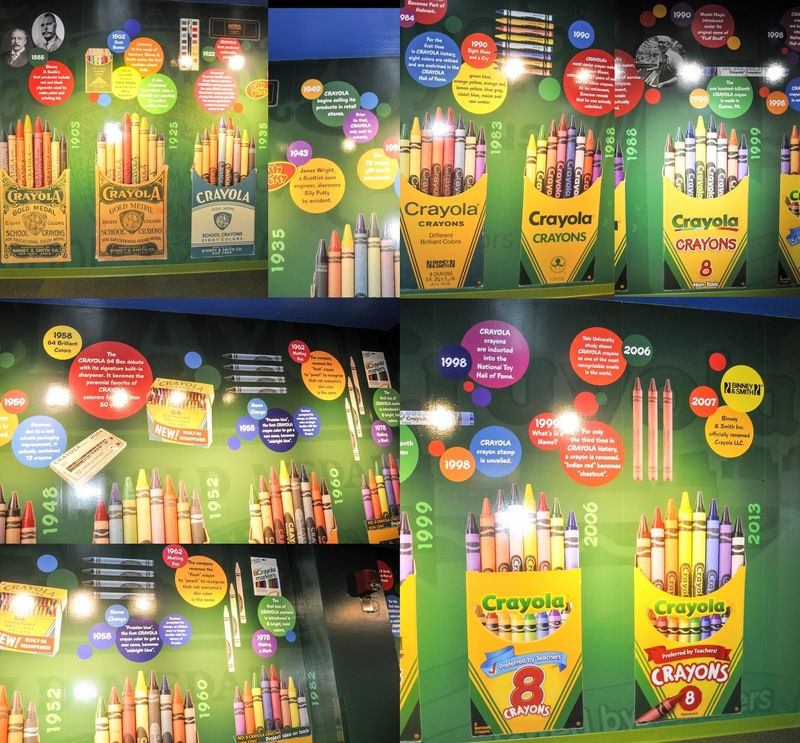 We had such a blast at the Crayola Experience in Easton, Pennsylvania. I would definitely go back and if I lived there I would want to get a season pass. I told my husband he should get a job in Easton. 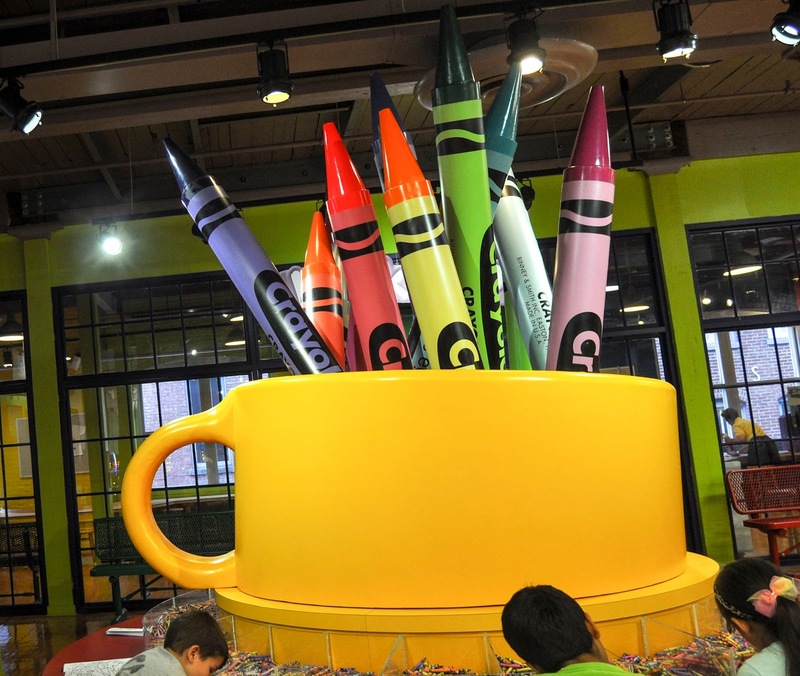 If you are visiting New York City or Pennsylvania make the drive to the Crayola Experience. If you have kids you will not regret it! Get your tickets today! I want to go back again and again.